John McCoy is the founder and CEO of Palm Spring Resort Homes, based in Palm Springs, California. Palm Springs Resort Homes is a boutique property management company catering to the exclusive end of the property management spectrum. John has an extensive background in the design and management of multi-faceted residential & commercial real estate projects. John is a graduate of Cal Poly San Luis Obispo with a Bachelor of Science in Landscape Architecture and is a licensed Landscape Architect and California Real Estate broker. After graduation, John launched his career in San Francisco, CA where he began his specialization in Landscape Architecture and Lighting Design. John designed and led a large variety of single-family home, private estates and large scale commercial and residential development projects in both the San Francisco Bay area and the greater Coachella Valley. In addition to exercising his creative talent in design, John was able to develop his financial skills and hone his business acumen while working in the field of personal financial planning. That eventually led to a perfect combination, making for a natural progression to property management where John assists clients in maximizing the investment potential of their real estate holdings. With an entrepreneurial eye, and the recognition of an existing opportunity with the property management business, John became the co-founder of TheBank Palm Springs. 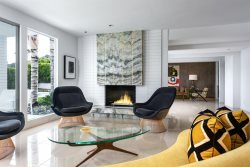 This business provides a much-needed mid-century modern event space that compliments the successful property management business.